The 'Your Choice Preference Scheme for Unaddressed Mail' is supposed to help householders reduce unaddressed junk mail delivered by distribution companies that are members of the Direct Marketing Association (DMA). That sounds complicated, and it is. If you don't want to spend too much time trying to stop leaflets coming through the door you might as well skip to the next page in this guide. Your Choice is a complicated opt-out scheme that's not going to make much of a difference. Still, if you're determined to ban leaflets from your life completely, registering with the 'service' is free and it might make a difference, however small. All other unaddressed mail – including free newspapers – can be stopped with an appropriate letterbox sticker. So, how much unaddressed junk mail does the Your Choice scheme cover? As per usual, the Direct Marketing Association won't tell us, and making a proper guesstimate is rather difficult. As at August 2013 there were 29 members of the Direct Marketing Association in the category 'Door Drop' (sadly, it seems they no longer want such information to be publicly available – the members directory is no longer online). Not all of these companies distribute leaflets themselves, and some cover only local areas or specialise in distributing leaflets as inserts in free newspapers (which aren't covered by Your Choice). In other words, there are just a few distribution companies that will check to see if you're registered with Your Choice. That said, lists does includes some major junk mailers, including TNT Post. In short, nobody knows how much junk mail Your Choice can prevent. And, to top it up, people registered with the scheme have no way of establishing how many leaflets Your Choice is preventing. 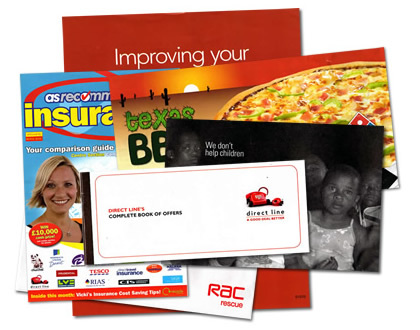 After all, leaflets don't tell you the name of the company responsible for its distribution, let alone whether or not that company is a member of the Direct Marketing Association. If you have a 'No Junk Mail' sign on your door you don't need to register with Your Choice. Just about all leaflet distribution companies nowadays instruct employees to respect 'No Junk Mail' signs, and it's just about unthinkable that a distribution company that's a member of the Direct Marketing Association would tell employees to ignore such signs. "Members must have in place a structure to enable every effort to be made to respect a householder's wish not to receive unaddressed items, whether such requests are made directly to the member or via any industry schemes approved by the Association." Strictly speaking, a 'No Junk Mail' sign is not a request made directly to the member . The Code uses the adverb 'directly' because the Direct Marketing Association would like you to write to senders you don't want to receive leaflets from (they're here to make things easy for you, right?). Still, a 'No Junk Mail' sign is a request not to receive unaddressed items, and of course it isn't much of an effort to respect such a request. In any case, distribution companies know that ignoring 'No Junk Mail' signs is not going to do much to improve their reputation - and refusing to respect people's wishes is unlikely to make clients very happy. The moral is that the Your Choice scheme is redundant. If you want to stop leaflets you only need to put a 'No Junk Mail' sign on your door and register with the Door-to-Door Opt-Out (as Royal Mail does instruct postmen to ignore 'No Junk Mail' signs). To understand why Your Choice has nothing to do with an opt-out service you need to know that the Direct Marketing Association never wanted an opt-out scheme for unaddressed mail. It regards opt-out schemes as blunt instruments . They much a prefer a system whereby 'consumers' (not 'people') contact those organisations from whom they don't want to receive 'direct marketing materials' (not 'unsolicited mail'). Your Choice was born because Government told the Direct Marketing Association to introduce an opt-out service for unaddressed junk mail. The demand was made in the Waste Strategy White Paper Government published in 2007. It was thought that an opt-out scheme for unaddressed junk mail along the lines of the Mailing Preference Service would make it easier for householders to reduce unwanted junk mail. Sadly, the Direct Marketing Association complied with the letter of the demand, but not with its spirit. Every effort has been made to ensure that Your Choice is as limited as possible…. It's interesting to that note the Direct Marketing Association hardly advertises the existence of its opt-out scheme for leaflets. For about two years there was a single page with information about the scheme on the website of the Direct Marketing Association. The page didn't exactly encourage people to request an opt-out pack, and perhaps it wasn't surprising that the page was removed when the Direct Marketing Association redesigned its website in July 2011 (the page has been cached though). Only after I started using the complete absence of information about the Your Choice scheme as an example of how industry self-regulation is failing did they add some information about the scheme to the website of the Mailing Preference Service in November 2011 (where it can still be found). The marketing strategy is to prevent people sign up to Your Choice. I suspect the latter is the case. The Direct Marketing Association is fully aware of the fact that the take up of the Your Choice scheme is extremely low. In April 2010, the Direct Marketing Association had to report Defra that at that time only 1,600 household were registered (that's 0.006% of all households in the UK). The organisation was worried about this. A meeting of its Governance Committee in March 2010 raised the concern that should the number of registrations on the file not increase, Defra may push for a change in legislation . In its subsequent meeting, in May 2010, the Governance Committee noted that a review of the publicity strategy for Your Choice was urgently needed . Interestingly, Defra did push for change. In November 2011 Defra forced the junk mail industry to merge Your Choice with the Door-to-Door Opt-Out. The new service would – for the first time – allow people to register online. The 'Door-Drop Preference Service' was to be launched in April 2012 but has has since been scrapped as a result of concerns raised by the junk mail lobby. The opt-out pack contains three pages with information about the blessings of unaddressed mail and the limitations of the Your Choice scheme. A pre-paid return envelope, something which bulk mailers usually enclose if they want a response, is not provided. And after the form has been returned it will take no less than twelve weeks before your opt-out becomes 'fully effective' (exactly twice as long as Royal Mail's Door-to-Door Opt-Out). It just goes to show that this scheme hasn't been set up because the Direct Marketing Association thought it was a great idea to give householders the choice to opt out of receiving unaddressed mail. Question: how many of these six leaflets was delivered by a distribution company that is a member of the DMA? More worrying is that householders are unable to judge whether or not their registration with Your Choice is making a difference. The scheme is supposed to stop unaddressed mail items delivered by members of the Direct Marketing Association. Which is great, provided that you are able to establish whether or not a particular leaflet was distributed by a member of the Direct Marketing Association. And guess what… you can't. When I asked the Direct Marketing Association how people are supposed to know if a leaflet has been delivered by a member of the association they replied that it's possible to check its online members directory. What they conveniently ignore is the obvious fact that junk mail never includes information about the company responsible for its distribution. As a result you have no way of knowing how useful the opt-out is. Your Choice must be the first opt-out service that will never attract a complaint about its effectiveness. Free newspapers do not come under Your Choice. There's a sound reason for this; many people don't want to receive leaflets but do want to receive free newspapers and other circulars. If you want stop such items, get a 'No/No' letterbox sticker and/or write to the publisher of your paper. Registering with the Your Choice scheme doesn't automatically register you with the Door-to-Door Opt-Out, even though Royal Mail is a member of the Direct Marketing Association. Your Choice is a household opt-out. If you opt out, your whole household is opted out. The Your Choice rules state that you must seek the approval of all adult members in your household before returning the opt-out form. The rules also state that if you share your front door / letterbox with other households you cannot register. A registration with Your Choice expires after two years. When the scheme was first set up there wasn't an expiry date; if you opted out your address would be opted out forever. This changed in November 2011; your registration will now expire after two years from the date of registering. The Direct Marketing Association will not send you a new opt-out form when this happens; you'll have to remind yourself to re-register every two years. Businesses are not allowed to express Your Choice. You can only register your private home address. As it's next to impossible to establish whether not a piece of unaddressed junk mail was distributed by a distribution company that's a member of the Direct Marketing Association it's unlikely that anyone will ever make a complaint about the Your Choice scheme. Nevertheless, if you do have a complaint, contact the Direct Marketing Association via yourchoice@dma.org.uk, in the first instance.